The beginning of Prime Cut follows a mysteriously packed package of meat as it journeys from Kansas City to Chicago, where it is received by Jake (Eddie Egan), the head of the Windy City’s Irish mob. The delivery’s significance is not lost on Jake, who promptly seeks out and recruits enforcer Nick Devlin (Lee Marvin) to head to Kansas and set things straight. Nick’s target is Mary Ann (Gene Hackman), a brutal slaughterhouse operator who is in debt to the Chicago mob for half a million. Rather than pony up the $500,000, Mary Ann makes a habit of killing any man that Eddie sends his way. Of course, none of those men have been Lee Marvin. Mary Ann promises Nick that he can collect the debt the following day at the Jayhawker Fair, where Nick confronts Mary Ann and his wife, Clarabelle (Angel Tompkins), Nick’s ex-lover. Clarabelle: You haven’t changed a bit, Nick. Nick: Well, nobody does. Not where it counts. As promised, Mary Ann hands over a package for Nick, though the latter quickly discovers that it contains nothing more than beef hearts. The double-cross alerts Nick to his own danger, and he takes off, hand-in-hand with Poppy (Sissy Spacek), a young woman that Mary Ann had intended to auction into prostitution. Despite Nick being humorously mistaken for a milk expert, the fair turns into a twisted North by Northwest-like adventure as Nick and Poppy narrowly escape from the claws of a combine harvester chasing them through a cornfield. “I’m sorry it was a lousy fair,” Nick deadpans to Poppy. For both his first scene in Chicago and the Kansas fair that leads to the film’s bloody and beefy finale, Nick Devlin wears a beige gabardine suit, similarly detailed and styled to the light gray suit he wore for his arrival in town. The suit turns out to be a fortuitous choice for the day with its neutral color helping Nick and Poppy hide int he cornfields after being chased from the Jayhawker Fair by Mary Ann’s shotgun-wielding henchmen. The suit’s details are very specific to the decade with the jacket’s wide notch lapels, hacking hip pockets, and extra long double vents that extend at least a foot. The single-breasted jacket has a two-button front and two vestigal buttons spaced out on each cuff. The jacket is cut with roped sleeveheads and a suppressed waist. Nick Devlin tries his hand at judging milk. The flat front suit trousers have a medium rise with tall belt loops, “frogmouth”-style front pockets like one would find on a standard pair of jeans, set-in back pockets with flaps, and slightly flared plain-hemmed bottoms. Nick and Poppy take off through the cornfield. Although common practice is for one to match his belt to his shoes, Nick Devlin’s belt is actually a closer match to his shirt and tie. The belt is made from medium brown leather with a large, asymmetrical gold buckle with an exposed single prong and an extended gold circle filled with red enamel. In a way, the effect of the red tie and the red dot on the belt buckle is similar to an exclamation point! Nick’s brown shirt for the Jayhawker Fair is covered in a field of beige dots. Nick wears a brown shirt in Kansas that calls out the earthy beige suiting. This shirt has a large point collar, a unique covered fly front, and a breast pocket with V-shaped stitching. He wears a maroon satin silk tie, tied in a long four-in-hand knot. The tie has a wide blade in accordance with the era’s trends. Before… and after. Note the unique details of Nick’s shirt, including the long point collar, covered fly front, and breast pocket. Any idea about the tie maker from the visible – albeit blurry – tag? Through the shirt’s double (French) cuffs, Nick wears a pair of large, round gold ridged cuff links. Nick’s shoes appear to be a very dark brown pair of textured leather derby shoes with squared apron toes. He wears them with dark brown cotton lisle socks. For the suit’s earlier appearance in Chicago at the opening of the film, Nick wears a point-collar shirt with red spaced stripes that barely contrast against the salmon shirting. He wears another red tie in a long four-in-hand knot, although this tie is made from a bolder and brighter scarlet satin. Red on red for his briefing in Chicago. 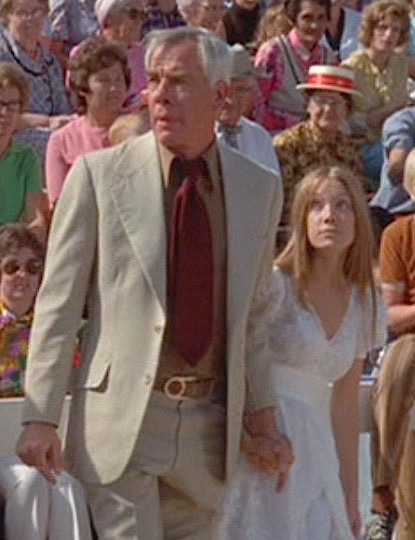 Lee Marvin’s Nick Devlin in Prime Cut is an unapologetically bold dresser. For the finale, Nick Devlin arms himself with a Smith & Wesson M76 submachine gun, an American-made copy of the older Swedish-made Carl Gustav m/45 originally intended for use by U.S. Navy SEALs. Like the m/45, the S&W M76 was chambered in 9×19 mm Parabellum ammunition that was fed through box magazines that can hold up to 36 rounds. The M76 was only manufactured from 1967 through 1974 and quickly became a mainstay of action movies throughout the decade including The Omega Man (1971), The Getaway (1972), Magnum Force (1973), Walking Tall (1973), The Taking of Pelham 1-2-3 (1974), and Dog Day Afternoon (1975). 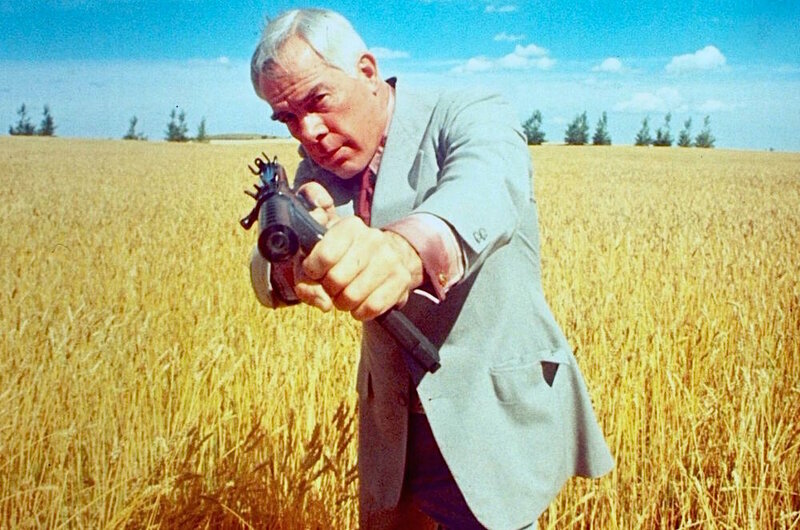 Publicity photo of Lee Marvin aiming a Smith & Wesson M76 submachine gun in Prime Cut. In the early years of the Vietnam War, U.S. Navy SEAL teams were often armed with the Carl Gustav m/45 submachine gun for covert operations in southeast Asia. As the nation was opposed to the American presence in Vietnam, Sweden placed an embargo on providing arms to the United States. In response to the embargo, Smith & Wesson cloned and modified the Swedish m/45 design to develop the open bolt Model 76, which went into production in 1967. However, was too late for usage to catch on among Navy SEAL teams as intended, and produced ceased after only seven years. Nick Devlin turns to his S&W M76 as he prepares for battle with Mary Ann’s henchmen. Smith & Wesson designed the M76 to be inexpensive to produce in mass quantities like its spiritual predecessor, the M3 “Grease Gun”. As he did with his M3 in The Dirty Dozen, Lee Marvin’s character “jungle tapes” two magazines for his Smith & Wesson M76 to ease the reloading process. When one magazine has expended its live ammunition, all Nick needs to do is eject it, flip it around, and reinsert it with the fresh magazine ready to go. You can learn more about the history and the screen appearances of this unique weapon at IMFDB. Was he a good guy? Then bury him! 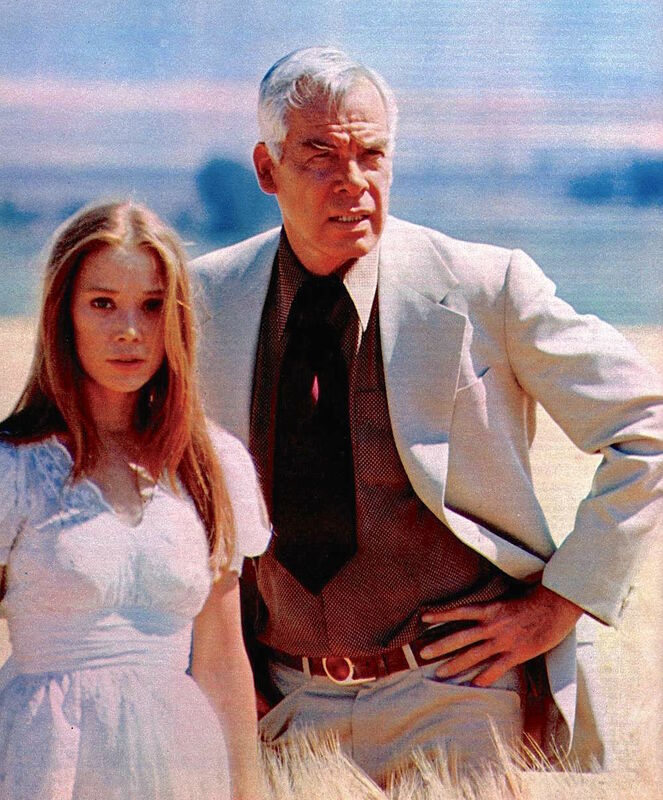 Lee Marvin at his finest in a very twisted movie,,, love the scene in the hotel restaurant with Sissy Spacek. Not sure there will ever be a remake. Quentin Tarantino is the only director I can think of to make one.